Q: What is your background, and what led you to become a scientist? I was born in western Turkey and moved to the United States, where I have lived for the past nine years, for my doctoral studies. My mom is a nurse and my dad is a high school biology teacher, so I was partly inspired to go into science because of their influence. But my inspiration to be a chemist started in the kitchen making cakes and designing new recipes. Baking broadened my creativity, and kitchen chemistry became lab chemistry for me. I studied chemistry for my bachelor’s degree, then I became more interested in materials science and engineering and built a diverse research background. In graduate school, I was first introduced to color-changing polymer nanofibers. I was fascinated with these miniscule nanoscale materials that you cannot see with your eyes but only through a powerful electron microscope. Q: What is the focus of your research at Argonne? 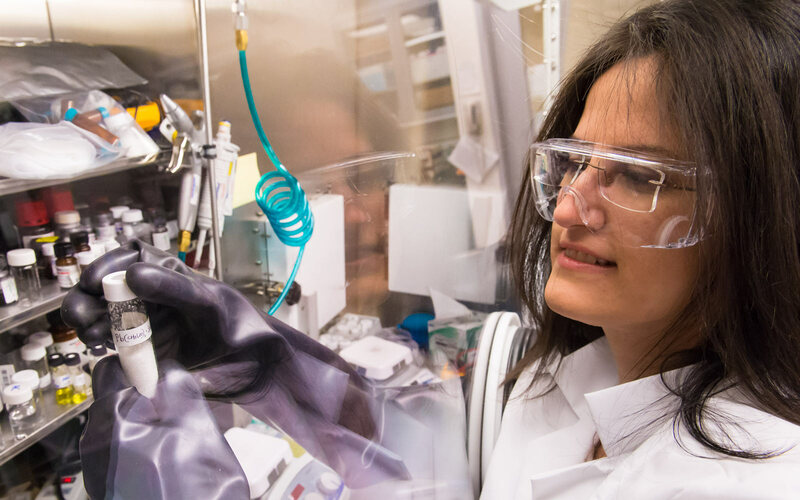 Thin films designed at the nanoscale are being used in the electronics industry to develop new technologies for fabricating high-power, flexible, and energy-efficient nanodevices. A material’s physical properties can change at nanointerfaces during process optimization and affect its optical, electrical, and mechanical properties, especially in the presence of moisture or other chemical molecules trapped between layers during fabrication, resulting in poor chemical stability and device operation.